I know it's actually been a while since I used the blog itself to post for Operation BSU; most of the content that I want to share with our readership and listenership is focused and singular, making it far easier to distribute via the Google+ community than to use the blog. But for some things you need a slightly more extended architecture, you need a means of sharing that can allow you do go on at some length with multimedia inserts. Since I'm really not interested in putting together a whole video (because I'm lazy, not because the content doesn't deserve it), it's a great time to bust out the blog. And today we've got an interesting sort of thing that came together purely by accident. I was off surfing the Steam recent additions, like I do regularly in order to have something to say on Sunday nights when I am Head Panelist on The Media Outsiders, when I saw something really strange. For years, literally, I've had an ongoing interest in a nontraditional game which takes as its inspiration the Star Trek bridge crew, a group of people with individual and specific jobs working together to fly a starship through a series of missions and return home safely. I don't think I'm the only one with that particular fantasy and it is certainly not limited to Star Trek fans – in fact, my guess is that Battlestar Galactica fans would be even easier and hungrier target. And for years, there has been one singular choice for doing that sort of thing, for putting together a crew with their own stations and running a series of missions as a team. 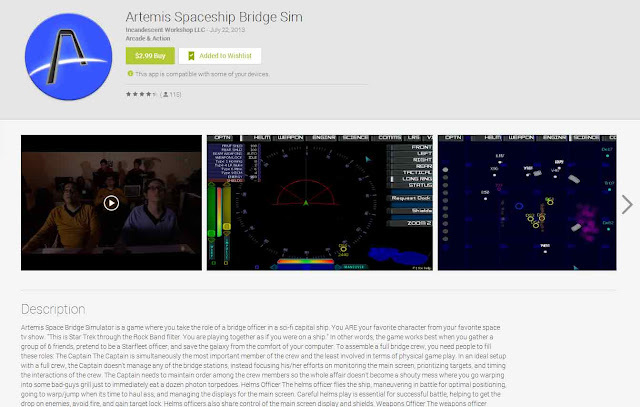 That one singular game was Artemis: Spaceship Bridge Simulator. They've been selling it for $40, which is a perfectly reasonable price to ask for any kind of game that you expect people to play in an extended fashion, but it's doubly – perhaps trebly – important to note that for $40 you had open license to put Artemis on up to 6 PCs, one for each bridge station and one central server to run the game itself. When you look at it like that, $40 starts to look like a bloody steal. That's a huge amount of gameplay for a very reasonable price. The author of the game has always maintained a 100% satisfaction-or-your-money-back-guarantee, going so far as to say if whatever means that you paid for it with originally interest too much hassle to get a refund through he'll personally write you a check and snail mail it to you. That's the kind of developer he is, and that's the kind of game he wants to put out. Already, we're off in unexplored territory in the galaxy of indie gaming development. That there are some big clanky balls. You have to respect that kind of self-confidence. That's right, you just saw a bunch of people like us – real geeks – sitting around in a room wearing uniforms appropriate to the game, cooperating (as best they can) to fly a starship, destroy enemies, rescue star bases, and be big damn heroes. And they are not alone. Over the last several years, the developer of Artemis has encouraged people to shoot video of their play sessions and put it on YouTube and in exchange he's been giving away free copies of the game. I'll just let that sink in. Just add a little more to the fire, I'll point out that many of these people are using/playing the demo which is available for free and provides only 3 stations: Helm, Weapons, and Science. People would enthusiastically video themselves playing, really enjoying themselves, and then – sometimes without them even deliberately and intentionally going out to be recognized – the author would send them a free bridge license. How cool is that? How awesome is that? This is a game that very deliberately has no DRM; it is not difficult to copy this game to multiple computers because it's intended to be. You copy this game to multiple computers to network them so that you can play the game. The author has decided that making that difficult would make getting people to play his game more difficult and that would be bad for sales, much worse than the absolute certainty that there is not only piracy going on but people simply passing around copies of the game as people want to join their crew and drop out. This is a very deliberate and simple and direct decision that is resulted in Artemis being one of the best and only games of its type. It hasn't starved to death because no one's playing it, it hasn't failed to continue selling because people are pirating it – it's hugely popular in its niche and everyone loves it. That's Freddie Wong and the Corridor Digital crew – guys who put together some of the most interesting and most exciting videos on YouTube – playing Artemis and having a good time. Perhaps an incompetent and flailing good time, but a good time nonetheless. This is the kind of thing that this game leads to, and that's fantastic. That's something you're not going to find anywhere else, for good or ill. So – that brings us back to the start of this whole thing. $40 for an entire bridge license. 5 seats, one server, $40. Perfectly reasonable. 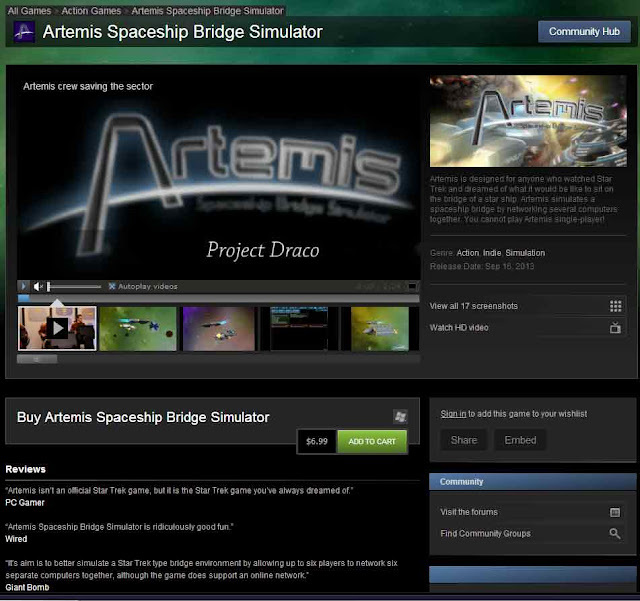 That is the current entry on Steam for Artemis: Spaceship Bridge Simulator. You'll notice that it is not $40. In fact, what they're selling on Steam is a single seat license (implicitly with server) for $7. That means that if you want to play the game, and you want to play it with other people – which is the only reasonable way to want to play it – everybody can buy their own seat license, nobody has to put all the money together upfront, and it only runs each of you $7. For 5 stations, that actually puts you $5 cheaper than buying Artemis from their website, plus you get all the advantages that Steam brings like automatic updates, news updates, built-in group and community chat (a really easy way to pull a crew together from people you don't know), the whole 9 yards… Except for DRM. I'm going to say that again: except for DRM. As far as I can tell, it looks like the distributed copy of Artemis through Steam is exactly the same as you would get if you bought a multiseat license from the website. There's a server, there's a client, and neither one of them appears to actually check with the Steam login architecture to validate that it is running under an active Steam account. I don't think this is an oversight. I don't think this is a mistake. I think the original author of Artemis made a choice to distribute the game through Steam just as he has been distributing the game over the years to an ever widening community. He is taking the chance that if you want to steal, there's no way that he can really stop you in a real sense, so there's no point in trying. Trying would just annoy legitimate customers who are trying to use what they paid for. Instead, he's giving you the tools and hoping that the game itself is compelling and motivating enough for you to go out and seek him out to pay him to reward him for making you happy. By moving to Steam, he's just made that process that much simpler. Not only that, he has reduced the amount that you have to pay in order to feel like you've successfully purchased a product that he has produced that made you happy. But let's take this one more step. After all, we're talking about a bridge simulator, something that requires multiple computers sitting around free, one for each station, right? That's a lot of stuff. Your friends might each have their own laptop and can drop by to play Artemis, but even a laptop is a little unwieldy. Surely we can do better than that, right? You are absolutely correct. Artemis 1.7, the last major version, released a bridge station interface capable of running on a tablet for both iOS and Android. The price for a single seat, non-server tablet license? $3. Just in case lugging a laptop around with you in order to the science officer on the bridge of the Artemis is too much work, you can lug your Nexus 7 or iPad with you and play on the same server. Okay, technically, this is a little problematic because as I noted the mobile version is still at 1.7 and the PC version was bumped up to 2.0 last month; they are not inter-compatible. Yet. The mobile version is slated to be updated to version 2.0 sometime in the next month. This is some seriously awesome stuff. This is the sort of thing that we like to talk about as being possible in the indie games development world but end up getting sidetracked into an endless stream of side scrolling, shader enabled, strangely incestuous games that get all the press and then disappear. This is a guy who want you to play his game, he wants you to play his game with other people, and he wants you to share that experience with as many people as possible – not only because doing so improves his market penetration via word-of-mouth, but because I believe he legitimately wants you to have fun and enjoy yourself. If you guys haven't already jumped on board the Artemis bridge, now would be a great time to drop $7 and get the latest version on Steam, find some folks ready to go out into deep space, and enjoy yourself. If you're thinking that you would really like the flexibility of having a tablet-based bridge station, I don't think there's anything wrong with the idea that you should hold out for another month until the mobile app versions update and then drop a whopping $10 for an "official" server, one PC seat license, and one tablet license (and incidentally all the PC seat stations you really need to play since you can copy the client off your own PC), and be privy to one of the most exciting experiences available in gaming today. $150 for a complete set of 6 Artemis bridge officer uniform accessory packs, that's right, a standalone fastenable collar, epaulets, and gauntlets, all Velcro-fastenable and adjustable, and ready to slap on your favorite bridge crew so everyone can look the part. Man, I really wish that I was devotee enough to want to buy those things. I really wish I had the time and effort to pull together a set of cheap PCs and/or tablets, get a full bridge license, put together a nice, solid mobile Artemis deck, and they go from con to con running Artemis and having a great time. Because that's what it looks like, a great time. Also, an excuse to scream, "main screen turn on!" And who doesn't want? Artemis: The Spaceship Bridge Simulator OST Updated for 2.0!